Shopping with Glenz: Looking For The Best Personalized Name Pendant? Looking For The Best Personalized Name Pendant? It is well known all over the world that providing jewelry as a present to someone you love indicates that they are truly special. The increasing trend in jewelry is having it customized such as a name pendant. These days, there are some places offering customized jewelry and it has even become stylish to put a name on a necklace. 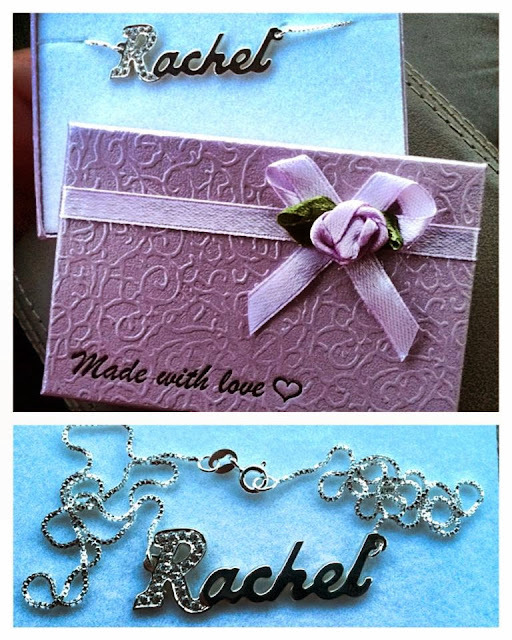 That is why I’m so glad to have been given this opportunity to review one of the best personalized name jewelry from this place called 9thelm.com. I was really surprised how great the jewelry looked when I received it. It is indeed a great piece and the quality is just awesome! As you can see here, I have the name of my daughter, Rachel. I haven’t shown it to her since I’m planning to give it to her on her birthday, which is a couple of weeks from now. This personalized name pendant is called STERLING SILVER SPARKLING SWAROVSKI NAME NECKLACE, it is sterling silver with an 18 inch chain and has swarovski sparking that shimmers brightly with the stones. I really love it and can’t wait to give to it to my daughter. Christmas is around the corner, so this would be a great present to get for someone you really like or love. To learn more about this awesome place, you can follow them on Facebook, Twitter and Pinterest so you can find the best gift for your loved ones.